What’s the most important thing you must do as a leader? The answer is: to lead. But what does leading mean, really? Ah-ha–that’s when the answer gets tricky. It used to mean you’re in front of the room, telling us what to do. But that’s not what real leading is today. If you’re a leader or someone aspiring to lead, you need to grow great teams, communicate a clear a vision and direction, and then . . . get the heck out of their way. Leaders fail when they’re the roadblock, the speedbump, or the barrier island to their team’s success. But how do you know when you’re getting in the way of your team? Smart leaders start asking this question of themselves from the start. 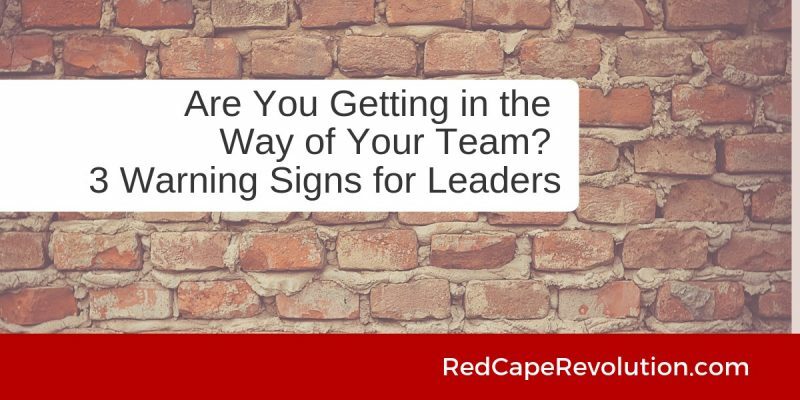 Smarter leaders know to watch for these warning signs, or if they can’t see them, to engage a coach or external colleague to check for blind spots. Warning Sign #1: You always have a better idea. Author and executive coach Marshall Goldsmith tells the story about a junior associate who was sharing an idea with his boss, Goldsmith’s c-suite client. As a result, according to Goldsmith, while the leader may have improved the idea by 5%, he took away that person’s ownership of the idea, and significantly reduced their commitment to it. His advice to leaders: stop adding value. Yes, it’s a noble thought, but when you steal the struggle, you steal the learning. You steal the opportunity to overcome, to feel successful, to come to new conclusions independently. Plus, you’re essentially saying you’re the smartest person in the room. If that’s true, you’re definitely failing as a leader. Warning #2: You’re in meetings that don’t matter. That means when there’s gap, our natural state is to fill it. If you’re concerned that you’re getting in the way of your team, resist the urge to fill those holes. In fact, creating more holes is exactly the best way to test what our team can and can’t do. Meetings are often black holes on our calendar, out there tempting us to explore and wander. Most leaders I talk to NEVER say “I wish I had more meetings.” So why not use your meeting schedule to test whether or not you’re getting in the way of your team? Now, cancel your attendance at meetings you’re attending simply to be seen. Sure, there’s a time and place for more visibilty as you manage your own career. But right now, let these meetings go so you can measure the impact on your team. Finally, decline other meetings where there are no decisions to be made–where the agenda is information-only. Let your team member handle it and debrief you later instead. Taking yourself out of meetings opens up a hole. It creates an opportunity for someone to step in and to try something different than you might. Alternatively, it creates a hole that causes no consequences–letting you know it wasn’t important anyway. The bonus of checking this warning signal is that you gain more time to focus on your real work–helping your team learn and grow. Warning #3: You don’t trust them. If you don’t trust your team, they know it. They see it. They feel it. Seriously, you’re likely not that good of an actor. If, for a personal emergency, you needed to step completely away from your life at work for a month, how would you feel? Listen to the voice that pops up first. Do you hear concern, that you’ll return to find your area of responsibillty in a shambles? Or , do you hear confidence, knowing that your team will stretch and keep everything that’s truly important on the right track? If you don’t trust your team, you’re certainly getting in their way. After all, trust is the snowplow that clears the way for your team to succeed. Before you try to change your team, try these strategies to change yourself. Not only will building your trust muscles benefit those you work with, but it’ll make you a better leader overall, no matter who’s on your team.